I had a problem. I would constantly find an interesting or helpful article/website/bit of information but never had any good place to store it. I’d tried bookmarks, social bookmarking sites, Evernote, and every other tool that would pop onto my radar. While many of these tools are great, and work well for a large number of people, none of them ever worked for me. Snippets of websites, tags, text recognition, all lacked one vital element for my needs: a greater sense of context. I didn’t want to just save a website; I wanted to put that website into a larger context. It needed to fit into a comfortable nook within my existent knowledge. It needed to be a flexible and robust encyclopedia for my brain. That’s when it clicked. I needed my own personal Wikipedia. Wikipedia is powered by the free, open-source application MediaWiki. MediaWiki is super easy to install (especially with Softaculous) and new information can be quickly added. Plus, if you already have a hosting account, you can setup a subdomain — or get over excited and buy a new domain — for your MediaWiki install and it won’t cost a thing. First, set up a subdomain and install MediaWiki. Most hosts will have an install script for MediaWiki, but the install is still super easy even if they don’t. Now you have your own wiki. Keep in mind, your new wiki will be public to anyone who stumbles upon it. You may want this, but that didn’t really suit my needs. I wanted this to be a private place, available only to me, to store all of my uncensored thoughts, unformed ideas, and any other information that may only make sense to me. This does a few things: it disables reading/editing by anonymous users while still allowing access to the login page and prevents new user registration. Now you have a private wiki, easy as that. As with any organizational system, the real power comes from constant and consistent use. If you haven’t read Getting Things Done by David Allen (affiliate link) stop right now and get that book. The best way to think of your wiki is as a super-charged “filing cabinet.” Not only can you store important information and resources as you’re “processing your inbox,” but you can link bits of information or documents together and leave yourself notes. Again, your use of this tool needs to be consistent. If you stumble upon a piece of information that you want to remember later, always add it to your wiki. If you’re in doubt, add it to your wiki. You can always delete things in the future as your needs change. But if you constantly turn to your wiki to thinking that you saved a certain link and it’s not there, you’ll quickly get discouraged from using your new tool. Create pages for topics that are relevant to your needs, and start filling them with information. I’d had my wiki for over a year now, and have created quite a few pages in that time. Some of these pages only have one link, one fact, or one piece of information. That’s fine. You now have a page where you can add new information as you need. Don’t worry too much about learning all the details about formatting your wiki (unless you feel so inclined. Just remember, you’re the only person who is going to see your wiki, so it’s the content that matters, not perfect formatting); just the basics will suffice. In fact, if you just learn how to do headers, bullet points, and links, you’ll be fine. I’ve collection information that is relevant to my own needs. If you’re an architect who designs buildings, your design page may be completely different. You many want to create completely separate pages for different elements relevant to design. As someone who is teaching myself to code and build applications, many of my saved information gravitates towards development resources. The best part of having a wiki is re-discovering your information. 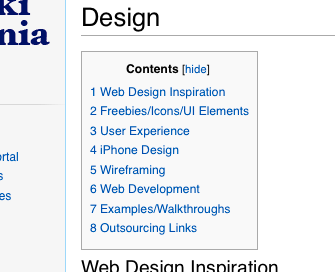 If you are working on design, open up your design wiki page and quickly browse all the information you’ve saved over the years. You may rediscover something you don’t even remember finding in the first place. 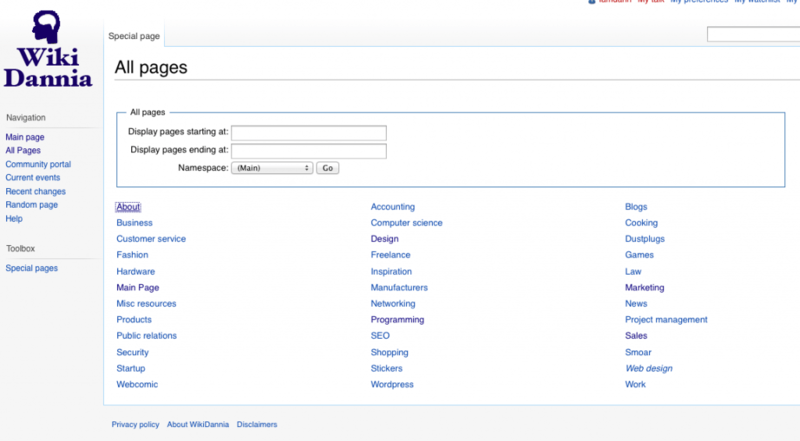 In addition to topics, create a wiki page for each of your projects. Use it to save information such as fonts, relevant links, brainstorming ideas, progress, inspiration, and anything else you can think of. Always keep that page open when you’re working on that project. It’s a great and reliable home-base for all your information. Plus you can easily link project pages to topic pages to quickly navigate to relevant information. Personally, I’ve seen a great increase and productivity and my ability to recall information since setting up my wiki. Having such a robust tool to record everything I find has proved invaluable for every project I’ve worked on since, regardless of size or scope. I understand that these after effects aren’t necessarily unique to MediaWiki. Everyone needs to find their own way to organize and manage their thoughts. That can be Evernote, Omnifocus, Clear, or old-fashioned pen and paper. I understand that MediaWiki may not be the right fit for everyone and you may need to experiment to find a system that works for you. But MediaWiki is the perfect tool for me and might be great for you as well. Do you already use MediaWiki as a personal encyclopedia? Any tips or tricks you want to add?